The index can be sorted by clicking on one of the column headers. A second click on the same header will sort in reverse order. The selected sensor can be modified on the next tabs. During the marking of an entry the associated track diagram symbol has a "yellow" background. Create a new sensor entry. Initially the ID is set to “New” which must be changed on the General tab. Delete the selected sensor entry from the list. 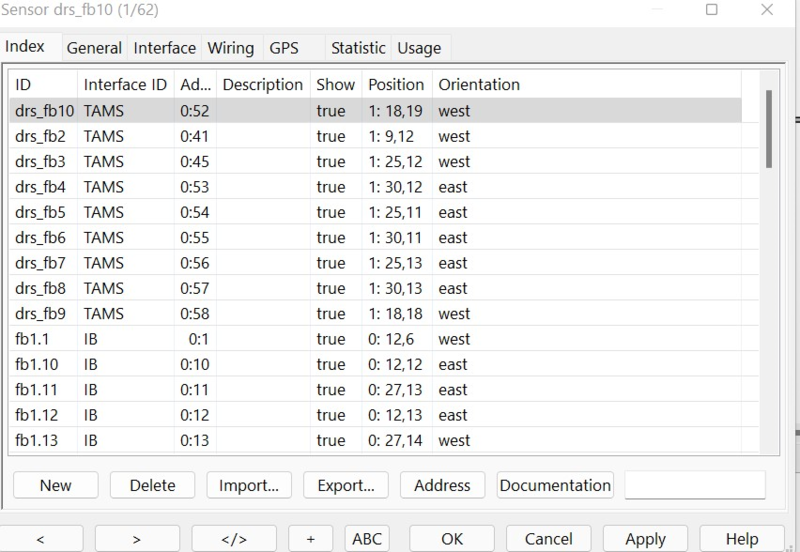 Automatically set the address for sensors with address zero. It will scan the list of sensors to detect the highest address and will use that as offset. This is only for use in case of virtual simulation.